Samuel Blatchford was an astute and conscientious jurist who served on the U.S. Supreme Court from 1882 to 1893. He was known primarily for his maritime and patent expertise and for his remarkable productivity. During his eleven-year tenure on the High Court he wrote 430 opinions and two dissents. His most noteworthy opinions, Chicago, Milwaukee & St. Paul Railway Co. v. Minnesota, 134 U.S. 418, 10 S. Ct. 462, 33 L. Ed. 970 (1890), and Budd v. People of New York, 143 U.S. 517, 12 S. Ct. 468, 36 L. Ed. 247 (1892), were roundly criticized for their apparently contradictory conclusions about due process under the Fourteenth Amendment of the U.S. Constitution. Blatchford was born in New York City on March 9, 1820, the son of Richard Blatchford, a lawyer, and Julia Ann Mumford. He attended Columbia College (renamed Columbia University), and graduated with honors at age seventeen in 1837. 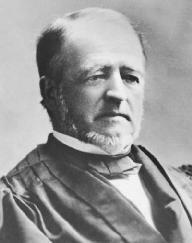 Blatchford served as a trustee of Columbia from 1867 to 1893. After graduation Blatchford became the private secretary of Governor William H. Seward of New York, a family friend. Blatchford studied law, was admitted to the New York bar in 1842, and practiced for three years with his father in Manhattan. Blatchford then joined Seward's law firm in Auburn, New York. He married Caroline Appleton in 1844. In 1854 Blatchford started his own law firm and he eventually became a respected authority on international, maritime, and patent law. Because of his extensive knowledge of patent law he was asked by lawmakers to help write key federal statutes governing patent infringement. Blatchford made a significant contribution to the legal profession by organizing a reporting system for federal case law. During much of the nineteenth century federal opinions were not compiled or readily accessible to practicing lawyers. In 1852 Blatchford collected and published federal court admiralty decisions in Blatchford's Circuit Court Reports, a series that grew to twenty-four volumes. He also produced Blatchford's and Howland's Reports, a volume of admiralty cases from the District Court for the Southern District of New York, and Blatchford's Prize Cases, a collection of cases from circuit and district courts. His case reporting is credited with improving legal research. Although Blatchford turned down an opportunity to sit on the New York Supreme Court in 1855, he eventually accepted another court appointment and rose through the ranks of the judiciary. In 1867 he was appointed by President Andrew Johnson as district judge of the Southern District of New York. Nine years later President rutherford b. hayes named him circuit judge for the second judicial circuit. "The importance of a learned, [and] high-toned bar, to the proper discharge of the functions of the bench, cannot be too highly estimated. The stream can never rise higher than the fountain." Blatchford reached the pinnacle of his career in 1882, when President chester a.arthur nominated him to the U.S. Supreme Court. Blatch-ford was Arthur's third choice for the seat vacated by Ward Hunt. Although the U.S. Senate had already confirmed New York politician Roscoe Conkling, Arthur's first choice, Conkling declined to serve. Arthur's second choice, Senator George F. Edmunds, of Vermont, also turned down the honor. Known as a hardworking and capable lawyer and judge, Blatchford accepted the nomination and was easily confirmed. In 1890, Blatchford wrote Chicago, Milwaukee, an opinion that shielded business from public regulation. The Court ruled that the reasonableness of railroad rates could not be decided by an independent commission established by the Minnesota Legislature. The state law establishing the commission was ruled unconstitutional because it did not allow for court review and therefore violated the railway's right to due process. Two years later, in Budd, Blatchford changed course and the Court held that the state legislature could determine business rates affecting the public interest. The inconsistency between the two cases produced widespread criticism. Blatchford wrote one significant civil liberties opinion, Counselman v. Hitchcock, 142 U.S. 547, 12 S. Ct. 195, 35 L. Ed. 1110 (1892), a case that strengthened the constitutional right against Self-Incrimination. Blatchford held that under the Fifth Amendment of the U.S. Constitution, a witness could not be ordered to testify unless the state promised never to use the information against her or him. Blatchford died in 1893 in Newport, Rhode Island, at age seventy-three. Leon, Friedman, and Fred L. Israel, eds. 1969. The Justices of the United States Supreme Court, 1789–1969: Their Lives and Major Opinions. New York: Chelsea House.